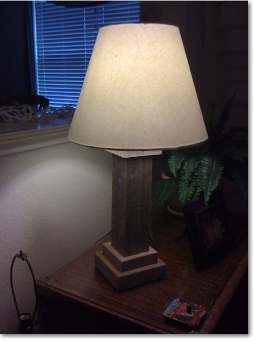 You can build this rustic table lamp from old fence boards or any other type of weather-seasoned wood. Since this lamp is made from scrap material, the base section of the lamp is free. Three 6' cedar or redwood fence boards (1x4) with the fewest knots (unless you like very rustic). The base of the lamp will be made up of four 1x3.25x18 inch pieces of wood (the fence material); each mitred 45° on the inside so that when the pieces are attached, you don't see any of the edges of the wood. To create these pieces, set your table saw at a 45° bevel and set the fence at 3 1/4". Feed one of the 1x4s (best side down) into the table saw to bevel one edge. Flip the board around (same side down) to bevel the other side. Repeat this process on another 1x4 fence board. 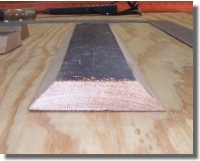 Using a miter saw or circular saw, cut off 1 or 2 inches of one of the new beveled 1x3.25 inch rips to square up one end. Measure 16 inches from the squared end and cut it. Repeat this process to create three more 1x3.25x18 inch pieces. Assemble the four pieces together with a brad stapler. You can apply a little carpenter's glue to the joints before nailing them together. This will make the body much stronger when it dries. 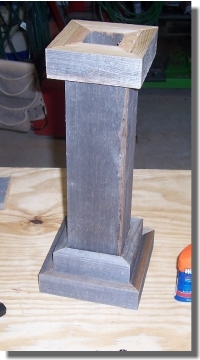 Build a lamp base... 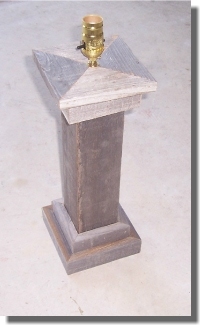 The bottom part of the base of the lamp will be trimmed with two courses of 1x material. The first, or inside course, will be made from the full width of a fence board (1x4). Bevel-cut each piece of 1x4 trim 45°, measuring the length of each piece of trim from the short point . Tip: Before mass cutting each of these pieces of trim, verify that the shaft of the base is the same measurement on all four sides. It is okay if it isn't; but if it isn't, you should custom cut each piece of wood so that it matches the length of the side it will be applied. 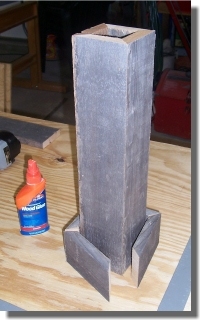 Attach the 1x4s to the base of the lamp, flush at the bottom, with a brad stapler using 1.25 inch brads. To complete the bottom part of the lamp base, measure the width of one of the unused 1x4s to get the exact width; it will probably be around 3.5 inches. Set the fence on your table saw to half of the width of the 1x4 (probably 1.75 inches). 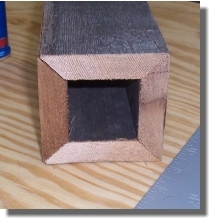 The idea is to rip the piece of wood in two, so that both pieces of the rip match in width. Use the new 1x1.75 inch material to trim out the lower part of the lamp, using the same method as the previous step (flush at the bottom). 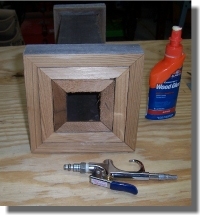 Be sure to position the ripped side of the 1x1.75 material facing towards the bottom of the lamp. It doesn't have to be done this way, but it will look better. :) There's always more than one way to make a lamp! 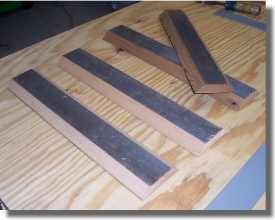 Next, make a square out of four 6 inch pieces of 1x4, cut at a 45° angle. Assemble the pieces with glue and brads. Once assembled, drill a hole at the center for the lamp socket to fit into. There are several different types of lamp hardware kits, so it depends on which one you are using as to what size hole to drill. At this point, follow the lamp kit instructions to complete the assembly of your new lamp. Add a lamp shade to finish the project. Now that you have built this rustic table lamp, you can use what you have learned to make other styles of rustic lighting.